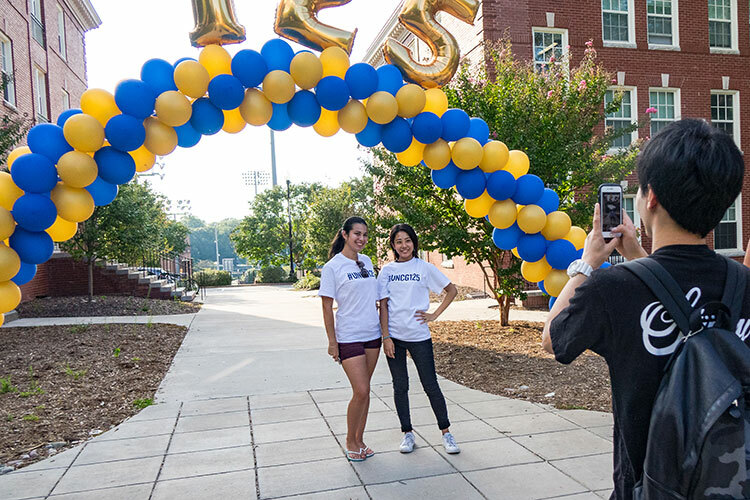 Help us celebrate UNCG history by participating in our #UNCG125 contest at Founders Day. Students and alumni are invited to share their photos and videos for a chance to win. Find the details below. Spartans: Students and alumni are invited to celebrate our 125th anniversary by sharing photos and videos during the week of Founders Day. We’ll select up to three winners to receive a prize pack that includes SpartanCash or an Amazon gift card. Post a “Happy 125th” message on Twitter or Instagram Oct. 2-5. Your post must be public and tagged #UNCG125. Don’t forget to wear your blue and gold! 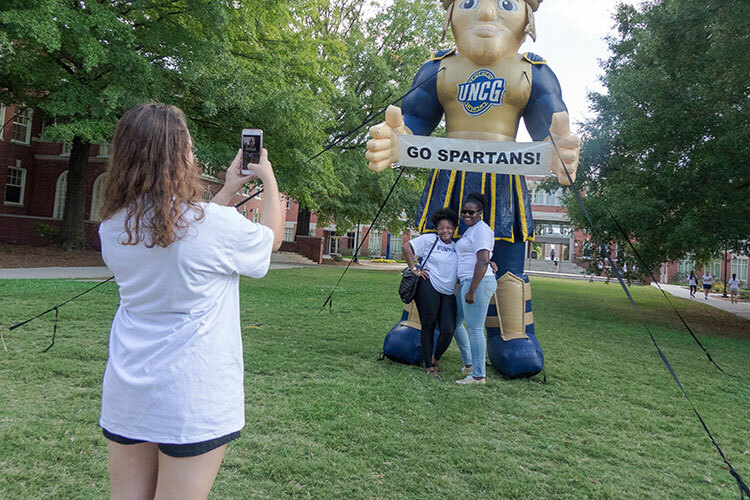 Students specifically are invited to send a “Happy 125th” snap to @uncgreensboro using our event filter during the Founders Day Festival between 4-6 p.m. on Oct. 5 on the Quad. If there are enough entries, we’ll pick a winner for each of the three platforms and announce on Friday, Oct. 6 on our social channels. Winners must pick up their prizes from University Communications, 1100 W. Market St., or another agreed upon location within 14 days, and agree to have their photo taken by University Communications for promotions. Current students must show their Spartan ID to claim a prize. Winners must be currently or previously enrolled at UNCG. Current UNCG employees and immediate family members are not eligible for prizes. People in the photo or video also must be aware of, and consent to, having their likeness submitted for publication. Contest participants must set their accounts to “public” to be considered as participating in the contest. Any illegal activity or activity that goes against the UNCG student code is grounds for disqualification. Other grounds for disqualification are at the discretion of UNCG. Videos and photos must be posted Oct. 2-5, 2017. Images posted prior to midnight on Oct. 2, 2017, are not eligible, even if they include the appropriate hashtags. This promotion is in no way sponsored, endorsed, administered by or associated with Instagram, Twitter or Snapchat. Images submitted for social media contests may be used in future publications with or without photo credit, depending on the use. All participants agree to the rules and regulations stated here for entry. UNCG reserves the right to disqualify any participants who disobey these rules or are found in violation of Instagram or Twitter’s posting regulations. 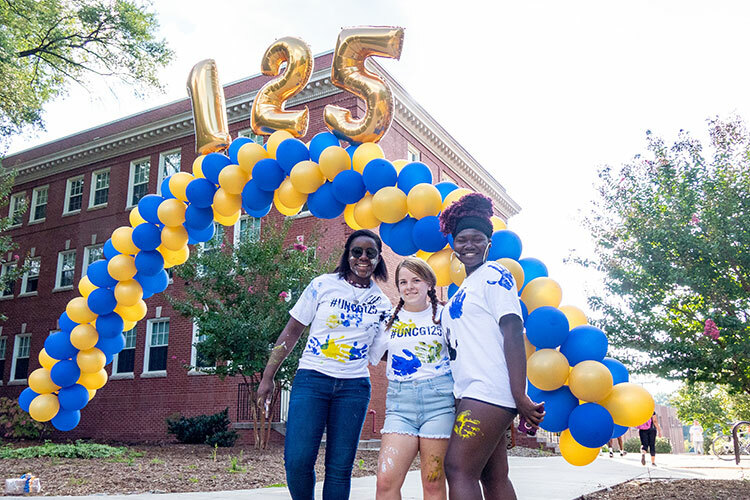 Share your 125th anniversary memories with the campus community by tagging them #UNCG125. Look for our Snapchat filters at special events!